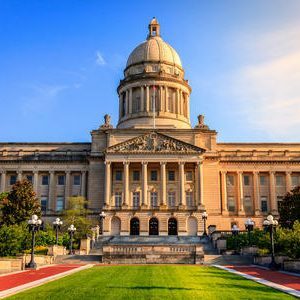 In a story that most of us frankly didn’t see coming, the state of Kentucky may be considering online poker regulation in 2019. According to a report from Online Poker Report, the Bluegrass State has a bill in place that would allow for online poker sites to operate in the state. This is an interesting development considering Kentucky’s past history of trying to seize online poker domains. The attempt to legalize online poker comes in conjunction with a bill that looks to legalize sports betting and Daily Fantasy Sports in the state. The bill we are referring to is House Bill 175, a bill that is primarily a sports betting bill, but also contains clauses pertaining to online poker. Since Kentucky doesn’t operate casinos, the bill would allow online poker sites to contract through the Kentucky Lottery Corporation to offer online poker. The lottery would not physically operate games in the state. If passed, poker rooms such as partypoker, WSOP.com, and others could apply to offer online poker within the state borders. This would be different from what is done in other regulated states. In other states, online poker sites are either operated by the state lottery or partnered with live casinos. Also, the bill would regulate Daily Fantasy Sports for a mere licensing fee of $5,000. This is one of four bills presently circulating through the House pertaining to sports betting. The other three bills would legalize live sports betting but will not bring online sports betting to Kentucky, at least not yet. There is also a fifth bill, H 175, that would allow for live casinos to operate in the state. Under the bill, four commercial casinos could operate in the Bluegrass State. Also, horse racing venues could apply for a limited license to operate slots. Out of the five bills, the casino bill has one of the biggest price tags as a casino license would carry a $50 million fee with the limited license carrying a $25 million fee. While we like to be positive regarding the state of online poker regulation in the United States, we don’t see a ton of potential in H 175. It seems to be a bit of an “out of nowhere” proposition that tacks on online poker and DFS onto sports betting. Kentucky hasn’t exactly been online poker friendly in the past, and it is hard to see them suddenly change course so quickly. Also, there are simply too many gambling expansion bills floating around this year and this is one that would likely get lost in the shuffle. Also, it is hard to see the casino expansion bill moving forward due to the high price tag of licenses and the fact that it would cut into the profits of horse racing facilities in the state. You can expect some major backlash over that one. At this point, one of the bills exclusively addressing sports betting has the best odds of moving forward. Live sports betting has the best odds of moving forwards legislatively in any state due to the fact that the Supreme Court has already ruled on it. Online gambling prospects, at least for the short term, offer a less unclear path due to the issues surrounding the federal Wire Act. While we would love to see online poker move forward in the Bluegrass State in 2019, we feel that this is more of a year of discussion and exploration for the matter rather than serious talk of regulation. We would not be surprised to see this bill quickly fall by the wayside to make way for more lucrative sports betting legislation.